Man wounded in terrorist attack donates Torah scroll to the synagogue at Hillel Yaffe Medical Center in Hadera. 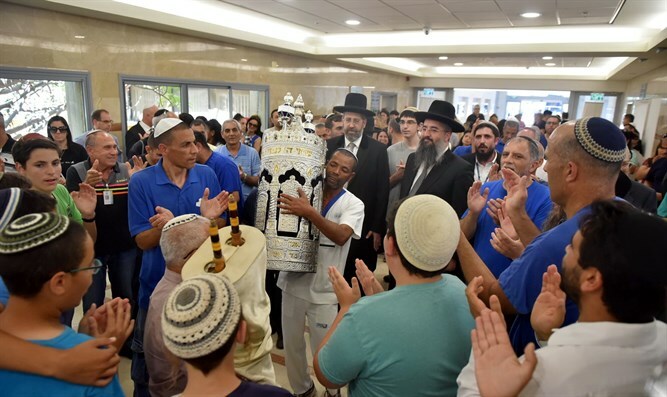 A new Torah scroll was placed in the synagogue of Hillel Yaffe Hospital in Hadera Thursday, in the presence of Ashkenazi Chief Rabbi David Lau and the director of the hospital, Dr. Miki Dudkevitch. The Torah scroll was donated by Yosef Haim Baruch, who was wounded in a terrorist attack and decided to donate the Torah scroll to the hospital in recognition of its devoted medical care. The ceremony was attended by the hospital staff and administration, local rabbis, hospital patients, and the donor of the Torah scroll and his family. "I congratulate the management of Hillel Yaffe Medical Center and its employees for its important position," said Rabbi Lau. "And I thank the donor, who, from a difficult personal experience, in which he was injured in a terrorist incident that left him with a mark, stayed with us and chose to give to the place which saved his life a precious gift, a new Torah scroll." Dr. Mickey Dodkevich, Director of the Hillel Yaffe Medical Center, said, "It is symbolic that, just before Shavuot, the holiday of the giving of the Torah, we are meeting here in very festive circumstances - the dedication of a Torah scroll into the synagogue of our medical center. My thanks to those who have done us a kindness and donated the Torah scroll, Mr. Yosef Chaim Baruch and his family." "At any given moment, we at the medical center do everything possible so that those who come to our gates will receive physical and mental healing and will enjoy an optimal service experience, often during the most difficult time for them. The existence of a synagogue in the hospital allows people to maintain their faith and their way of life without changing the hospital." he said. Rabbi Dovev Bindiger, the rabbi of the Medical Center, said that "most of the people who enter the hospital are concerned and worried about 'what will happen to me or what will happen to my relative'. Today we also saw that we could enter the hospital with great joy." "Today, on the second of Sivan, this is also the day when it is written that Moses ascended Mount Sinai for the first time in order to receive the Torah, and of course the proximity to Shavuot and the fact that we are also introducing a Torah scroll today have a symbolism and an exciting reception," Rabbi Bindiger said.